Could you please help with city mark. Many thanks! Hi Olga, to me it appears no images are showing? oel wrote: Hi Olga, to me it appears no images are showing? Hmmmm...dubious marks. Is the ring silver? What stone is it, difficult to see it from the picture. Qrt.S wrote: Hmmmm...dubious marks. Is the ring silver? What stone is it, difficult to see it from the picture. Silver )) 84 ) And rutile in quartz. Qrt.S...while we're here, the photos are lost where you identified a Polish transitional mark of a man with feathered cap facing right. Can you post an example of this for the record? Now..does anything here suggest Warsaw or nearby Polish areas where oddity marking styles might be found? Exactly what is mark #2 supposed to be? Was it added later in an open space? Sorry but no bells are ringing...When did it happen? Please gimme the topic number and I give it a try. OK, I'm with you now. Is the the mark you long for? I don't have a photo of a real mark only this drawing. Does the second mark look like the picture above (it looks more like a man with a beard) and where is the dot? In general the whole outlook of it is "odd"? That is why I am a bit suspicious. By the way, it would be interesting to know what is the exact diameter in mm of the second mark. The third mark from the left is definitively an attempt (unsuccessful) to depict the imperial eagle. AG2012 wrote: The third mark from the left is definitively an attempt (unsuccessful) to depict the imperial eagle. @Qrt.S...Perfect, thank you. Added link at original thread for view of mark here. No problem, but what is the actual problem, I don't get it? @Qrt.S Without the photos (now blank) the author's description of their supposed first Kokoshnik was tricky to follow. Since you mentioned the Polish Transitional mark was also applied to where old Russian marks existed, it seemed a good idea to get the shape of the mark and detail to eliminate it here and in any future searches that might run across that thread. Now...the only mark I see with six even sides, like the shape of mark 3 here, is a French Guarantee on silver imports in early 1800's regardless of the interior details. Obviously not of any help here. The closest Warsaw mark seems to be eight even sides. The mark is at least questionable in lieu of a six-sided sample. Anyone got such a mark? There are no six-sided Warsaw town marks. The court supplier marks have round shields or no shield. At least to my knowledge. Postnikova has also made a fatal mistake in her book by mixing Warsaw marks with Minsk (not to mention the maker's marks..."). See page 200, #1890a. The shown town mark is most likely Warsaw's mark. 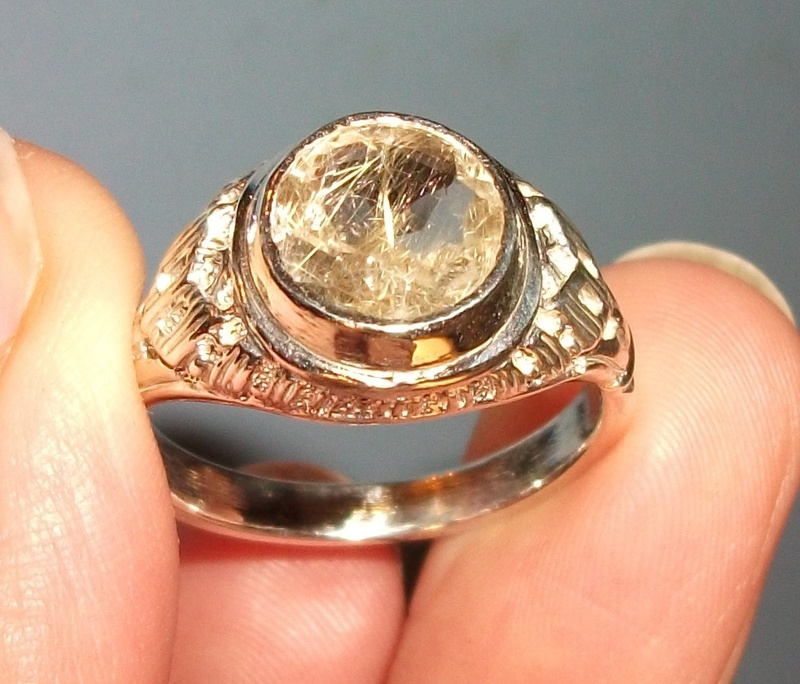 Frankly said, the marks on the ring are bogus marks. There Olga, Qrt.S has layed it all out. Marks 2 & 3 not even close to real known samples. Hope you have better days and finds. Bad marks are like insect control...they just come back in swarms! 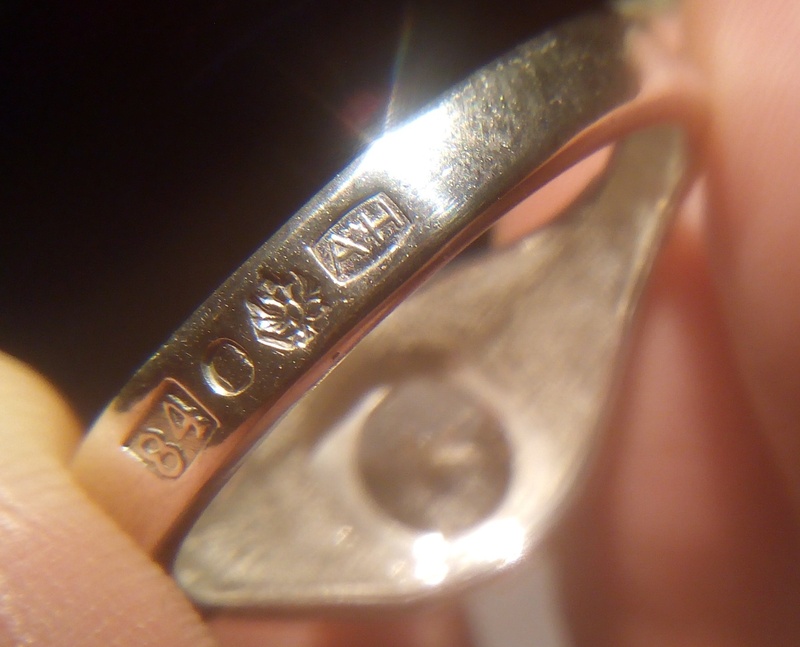 This marks (on the ring) are fals marks. Modern fake. How many "experts" are needed to expose a cheap fair fake?